« EXCITING NEWS! Phase 2 Station Square 4670 Assembly Way Burnaby Metrotown Condo Tower Grand Opening Previews Start April – BUY IN MAY! Located in the prestigious Oakridge Vancouver Westside neighbourhood, the OAK Townhomes in Vancouver are brought to you by Listraor, one of our favourite builders. Listraor is very well known for their custom service, high-end detailed finishing and boutique developments in the Lower Mainland and the Westside Vancouver OAK townhomes for sale will be one of their best offerings yet. Contemporary brick exteriors with natural timber detailing will be architectural features. Details like fir doors and wood trellies will grace these luxury Vancouver OAK Townhomes in Oakridge neighbourhood (blending seamlessly into this traditional and sophisticated community). Inside, home owner will enjoy over height lofty ceilings as well as open concept living spaces that give you room to store, grow and live. The Listraor OAK Vancouver Westside townhomes will also be centrally located within the Oakridge community, giving you easy access to shopping, entertainment dining and major transit routes including the bus, SkyTrain and more. There is easy access to YVR and Downtown Vancouver as well. More information will be launching soon on www.listraor.com so stay tuned! GRAND OPENING WEEKEND > April 12th between 12-5pm! An exclusive preview event of 33 modern brick townhomes in Westside Vancouver in one of the most desirable neighbourhoods is launching this coming weekend! Luxury 1 bedroom plus den OAK Vancouver townhomes priced from $798,800 (between 1,188 to 1,265 square feet). In addition, the stately 3 bedroom plus den Vancouver OAK Townhomes by Listraor will start from $999,800 and are between 1,695 to 1,829 square feet in size! The VIP Previews are only available through appointment, so please register your interest online at www.listraor.com today! The presentation centre is located at 6100 Oak Street Vancouver (at the corner of 46th and Oak) and they will be open between 12-5pm except Fridays. Located in Vancouver’s well-appointed west side, Listraor’s Oak townhomes continue a tradition of excellence in design and construction. Contemporary brick exteriors with natural timber details, including fir doors and wood trellises, bring warmth to these highly liveable spaces. Spacious overheight ceilings and superior craftsmanship ensure every detail is the definition of refined living. Oak’s central location in this prominent west side community ensures you are close to some of the city’s finest restaurants and shops, within easy reach of downtown and a short 15-minute drive from the Vancouver International Airport. 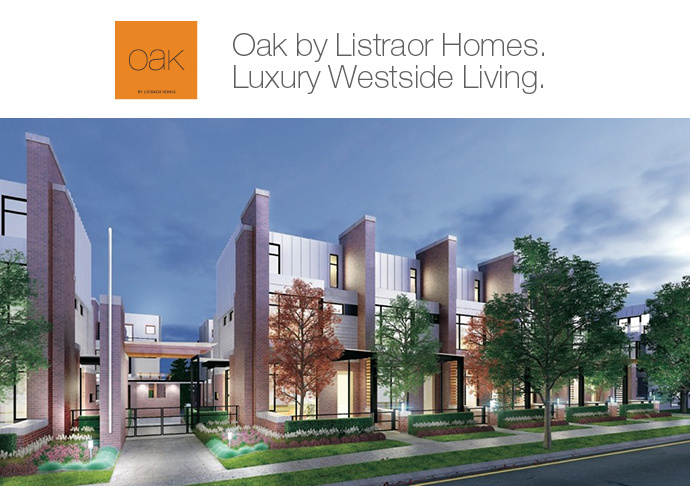 Oak by Listraor Homes, features 33 modern brick townhomes located within one of Vancouver’s most coveted Westside addresses. 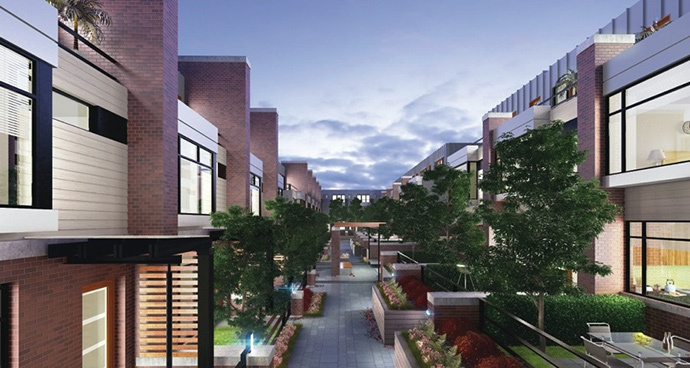 Modern Vancouver Townhomes at OAK by Listraor is featuring its grand opening preview on April 12th, 2014! Don’t miss this exclusive opportunity to own a Westside Vancouver Oakridge townhome by boutique developer Listraor. Offering eye catching architecture with a contemporary twist on true West Coast design, Oakridge Vancouver Townhomes by Listraor Developers is already under construction and will feature only 33 homes for presale. Brick exteriors with natural timber detailing including fir doors and wood trellises, overheight ceilings and open concept layouts with a warm, inviting ambiance make these new Oakridge Vancouver Westside townhomes an ideal fit for savvy families as well as downsizers. The central Oakridge Vancouver Westside location provides excellent proximity to some of the best restaurants, eateries, shops, big malls, downtown Vancouver and YVR in Richmond. The project is located at Oak Street and 46th Avenue Vancouver Westside. With its Westside Vancouver address, Oak by Listraor is close to everything you would need or want. Oakridge Centre is nearby, transit is convenient and Downtown is only 10 minutes away. At Listraor, we intentionally build homes in established neighbourhoods and weave seamlessly into the fabric of each community. Oak Vancouver Westside homes for sale exemplifies this practice to a tee. Listraor Homes is proud to partner with esteemed architecture firm Merrick Architecture. This award-winning, innovative firm is driven by a respect for community, culture, and the planet, and is consistently honoured for their outstanding work. They recently received accolades for project like the luxurious Dolce and Vita at Symphony Place in Downtown Vancouver, and the sophisticated Millenium Water in False Creek.